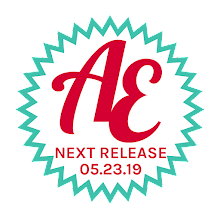 Our new release is next week & more! We are busy getting ready for our Summer 2014 release next week. There will be 8 new stamp sets and 6 new die sets available for purchase next Thursday, June 5th. I cannot wait to show you what we have been working so hard on! How about a little sneak peek?!? Previews will start on the blog next Monday so be sure to stop by then! 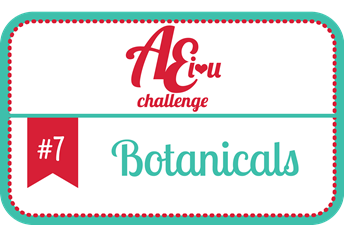 Have you checked out our new AEI♥U Challenge? The theme for this week is Father's Day / Masculine. A big congratulations to Maureen Merritt for winning the last botanical themed challenge with this gorgeous project!! So pretty! I also wanted to let you know that I will be at Stamp Fever in Orange, CA tomorrow Saturday, May 31st from 12-3pm. We will be making this fun card and I would love to see you if you are in the area. I am popping in today to share three cute projects by JJ and Heather. 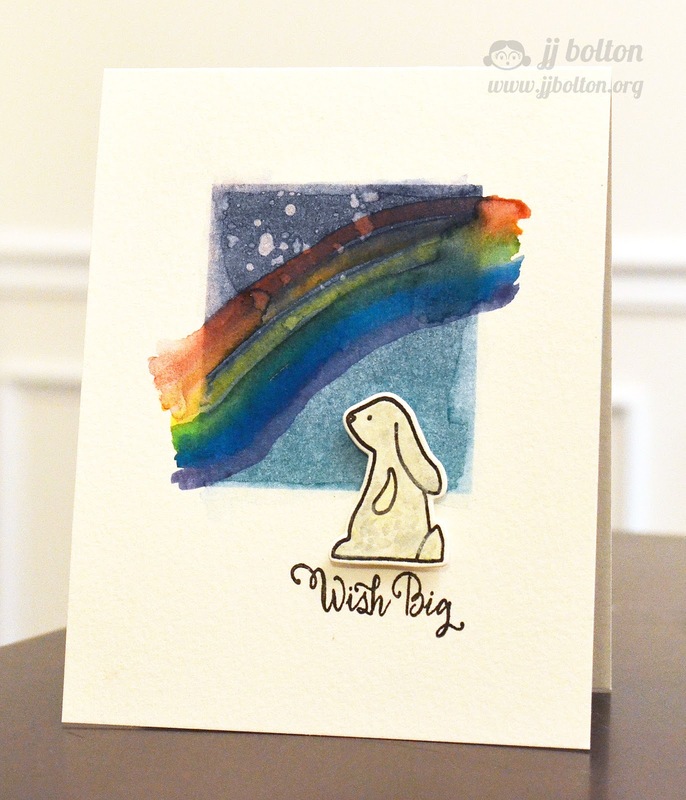 JJ created this first card using our Storybook and Weather It stamp & die sets. I love the combination! JJ also created this modern card using our Storybook stamp set. I love the watercolor rainbow! 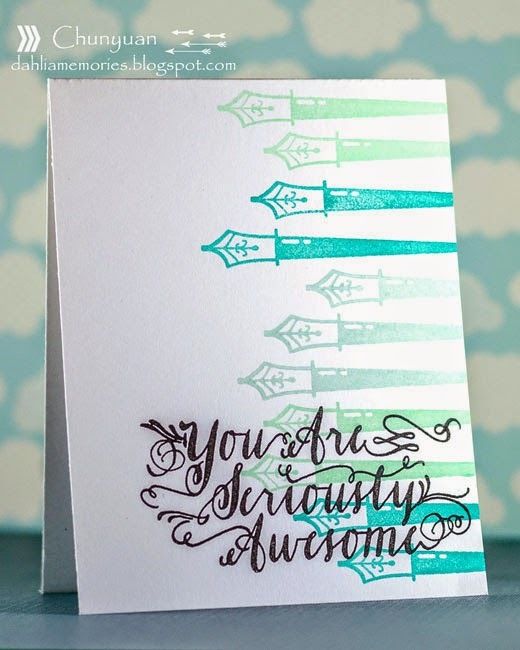 Heather created this sweet card using our Storybook stamp set. The background image is from our Woodgrain & More stamp set. 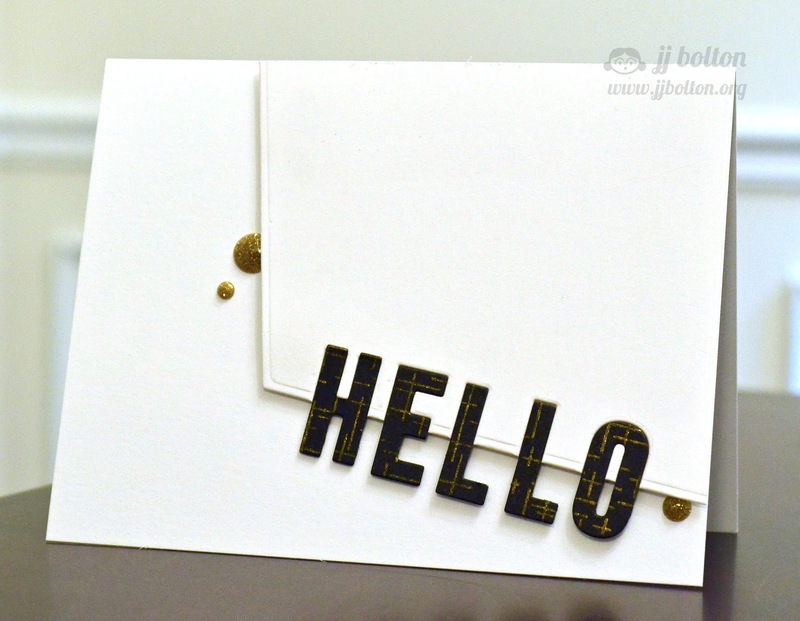 I love the texture that this cross-hatch stamp gives to projects! One more note, our friends over at AllFreePaperCrafts.com did a review of our Pigment Ink Pads and are having a fantastic giveaway. It is a great prize so be sure to check it out here. I have some cute projects to share with you. Today is our last day with our guest designer, Melania Deasy . It has been such a pleasure having her with us this month. I have been completely inspired by each and every one of her projects. We have been so fortunate to have her with us!! 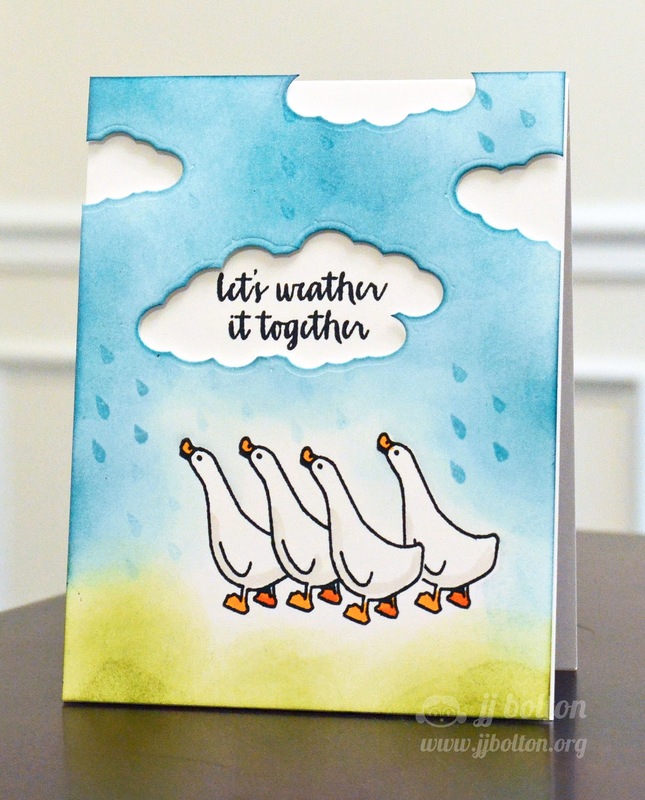 Check out this cute card that she created using our Weather It and Red & Goldie stamp sets!! I love how Red is holding the umbrella!! What a brilliant idea!! 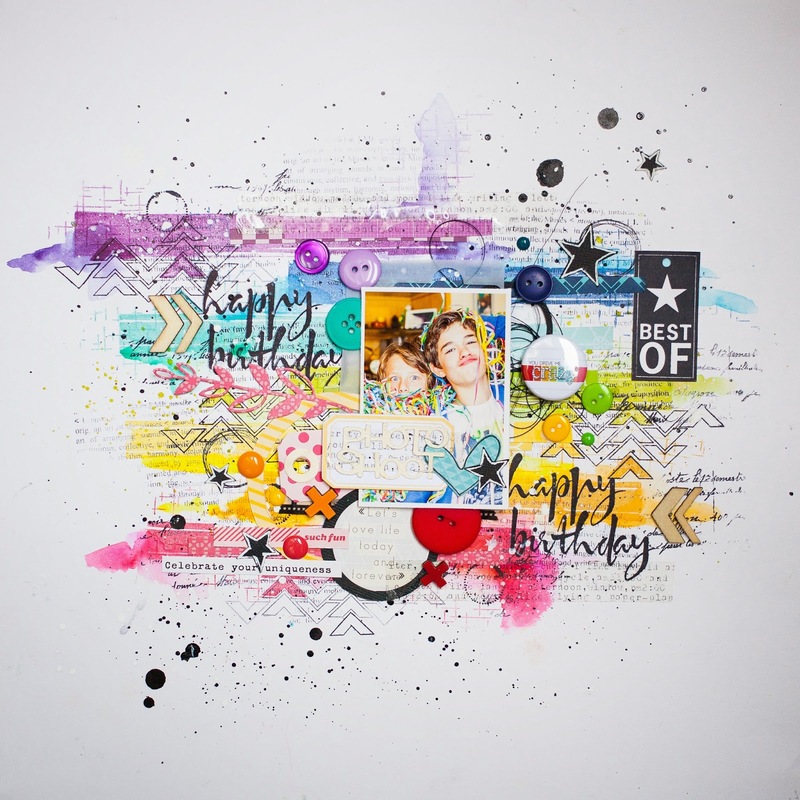 Maska created this layout using the happy birthday sentiment from our Brushed stamp set. I see some Texture Tiles: Be Cool images mixed in as well. I just adore all of the happy colors on this page. It is perfect to show off a celebration!! 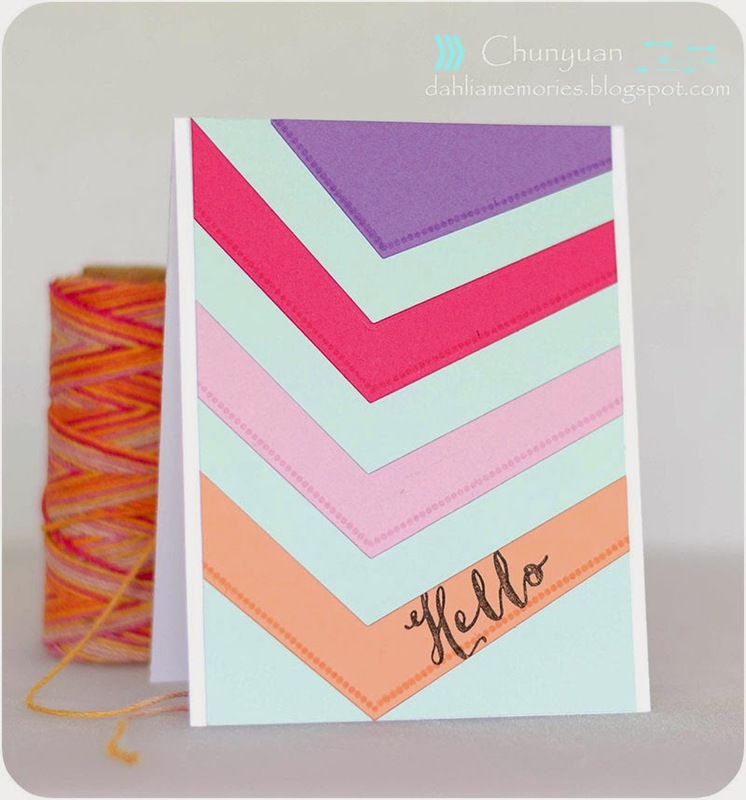 Chunyuan created this card using our Custom Panels dies and our Write It stamp set. I just love the modern arches that she created with the dies! Here is another card by Chunyuan. She used a sentiment from Red & Goldie along with our Custom Panels dies to create this great look. Super fun! Today I have these two adorable projects to share with you. 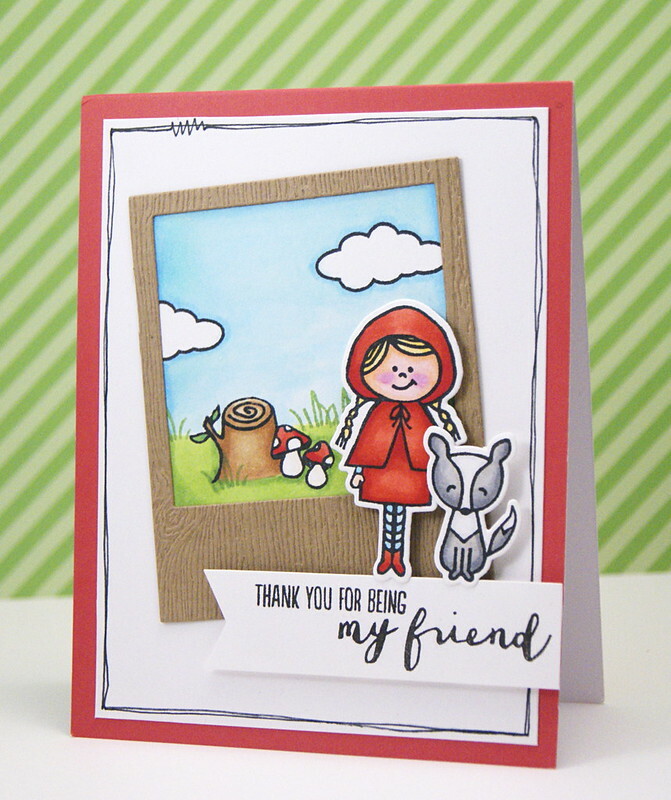 Yainea created this cute card using our Red & Goldie stamp & die set. I love the way she created the Polaroid scene behind Red and her fox friend. Perfection!! 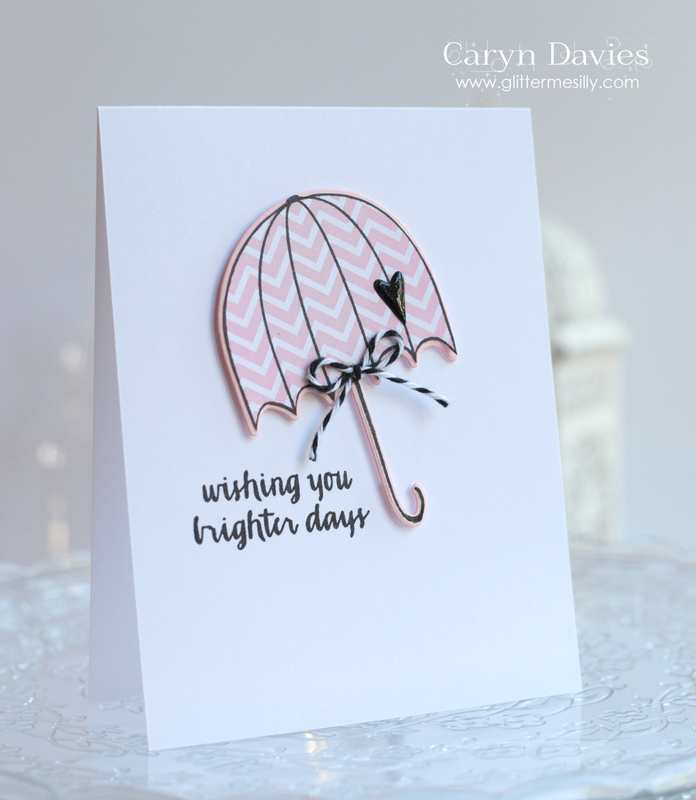 Caryn created this clean and simple card using our Weather It stamp and die set. Using the die to cut the umbrella out of patterned paper is a great way to add color! This card is so sweet. 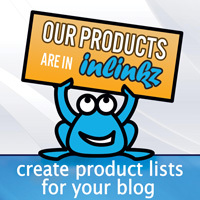 Be sure to check out our friend Jingle's blog all this week. She has some fun things planned to celebrate her Facebook page reaching 1200 likes. So cool! Today she has something fun that involves Avery Elle. Be sure to stop by here! Have you checked out our latest AEI♥U Challenge? The theme for this week is Botanicals. Our Challenge Design Team's samples for this challenge are AMAZING. You have to check them out!! I also wanted to let you know that I will be at Stamp Fever in Orange, CA on Saturday, May 31st from 12-3pm. We will be making this fun card and I would love to see you if you are in the area. Today I have three great projects by JJ Bolton and Heather Campbell to share with you. 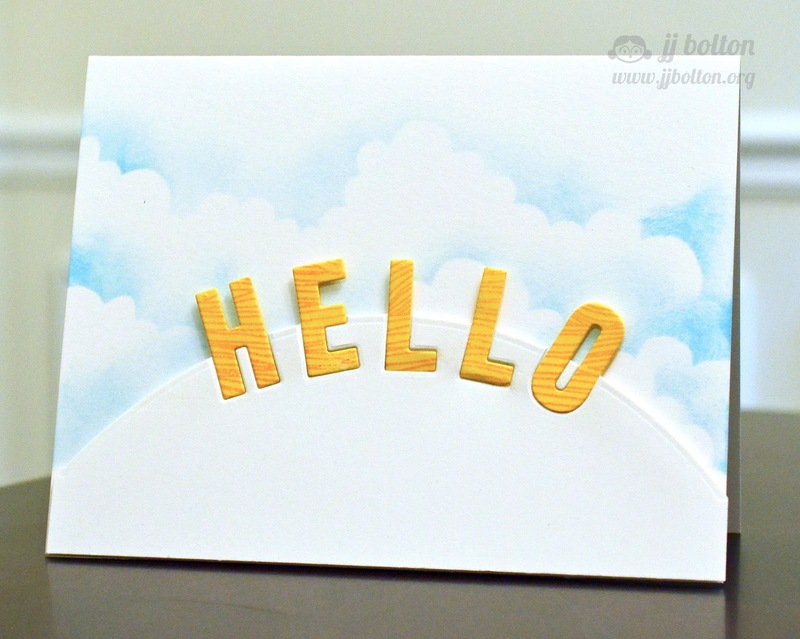 JJ's first card uses our Avery's Alphas dies to create the word hello and our Custom Panel die to create the hill. 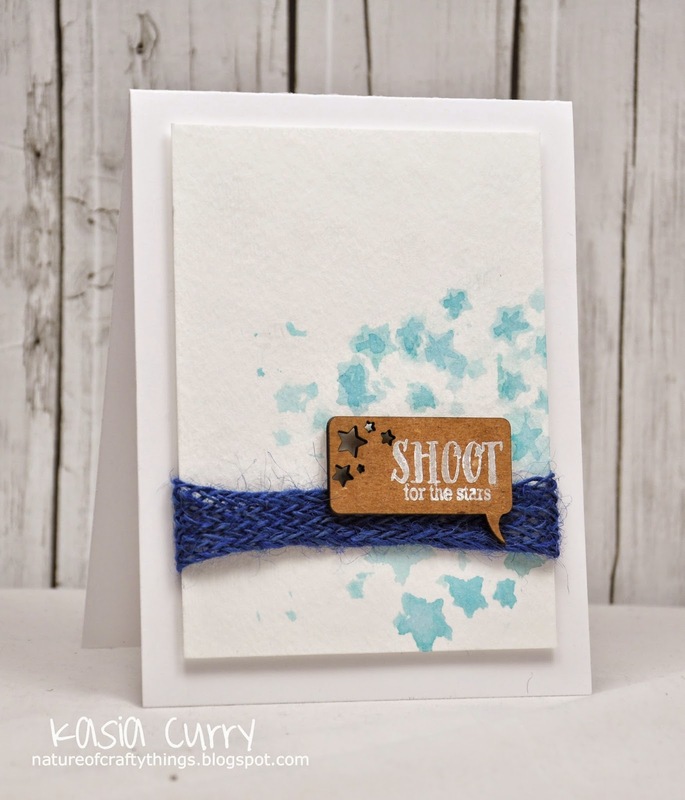 She added texture to the letters using the woodgrain stamp from our Woodgrain & More stamp set. So fun! I love this next card that JJ created. 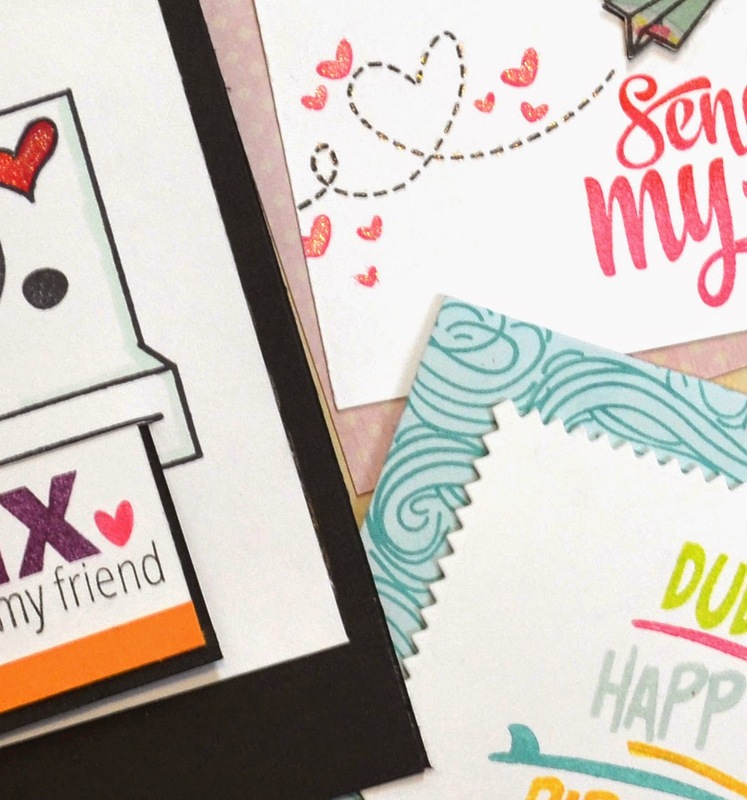 She used the same products as the card above- Avery's Alphas dies, Custom Panels dies and the cross hatch stamp from Woodgrain & More - to come up with a completely different project. I love the bold and modern look! She shows that these sets can easily be used to create many different looks. 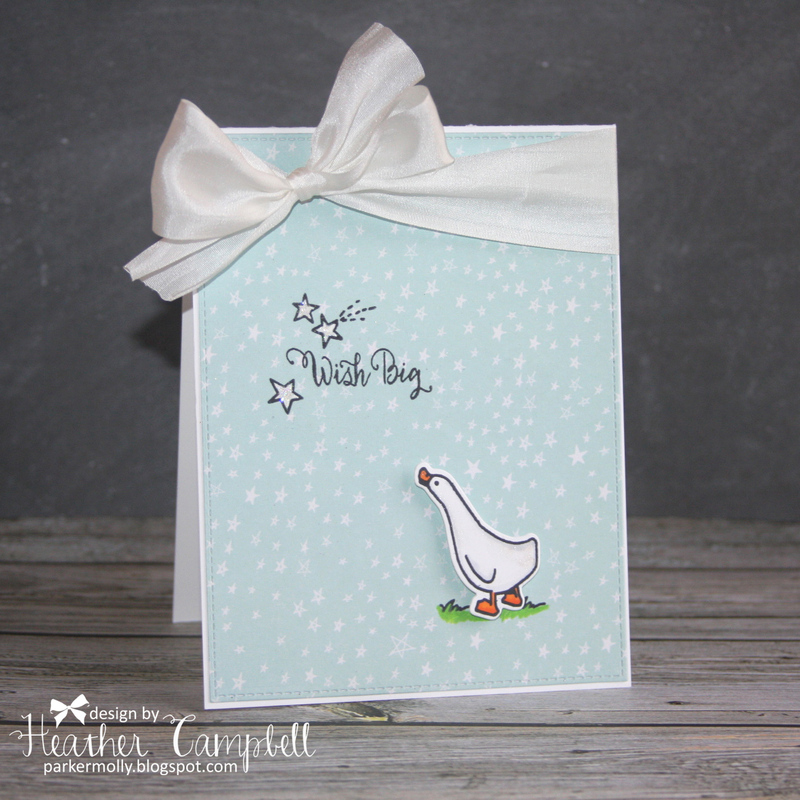 Heather used our Brushed stamp set to create this next card. 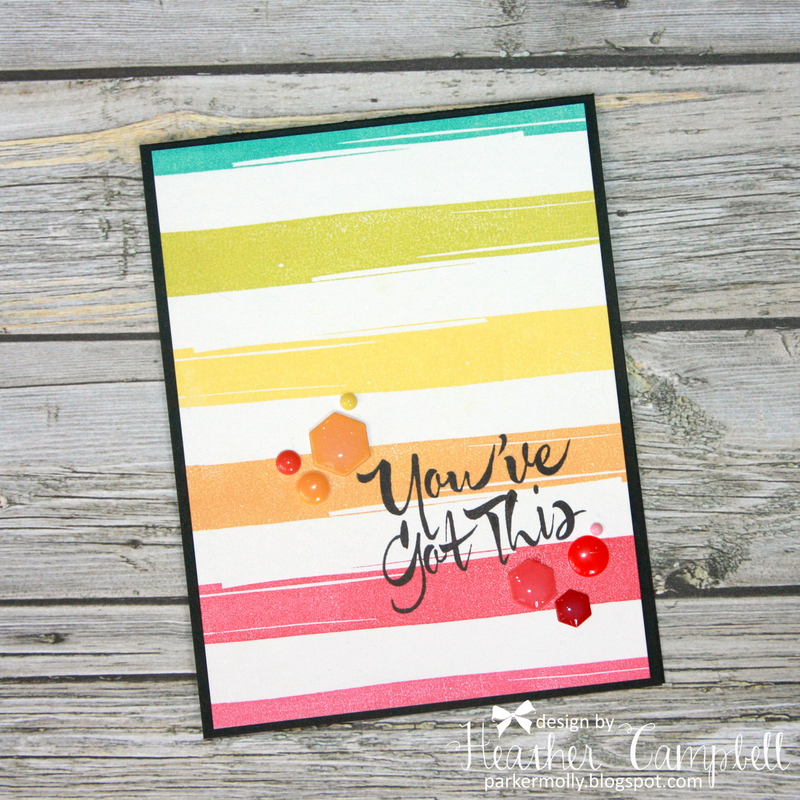 I love how she used our pigment inks to create the pretty striped background. The enamel dots she used are a perfect finishing touch! I am so excited because I get to share two amazing projects with you today. 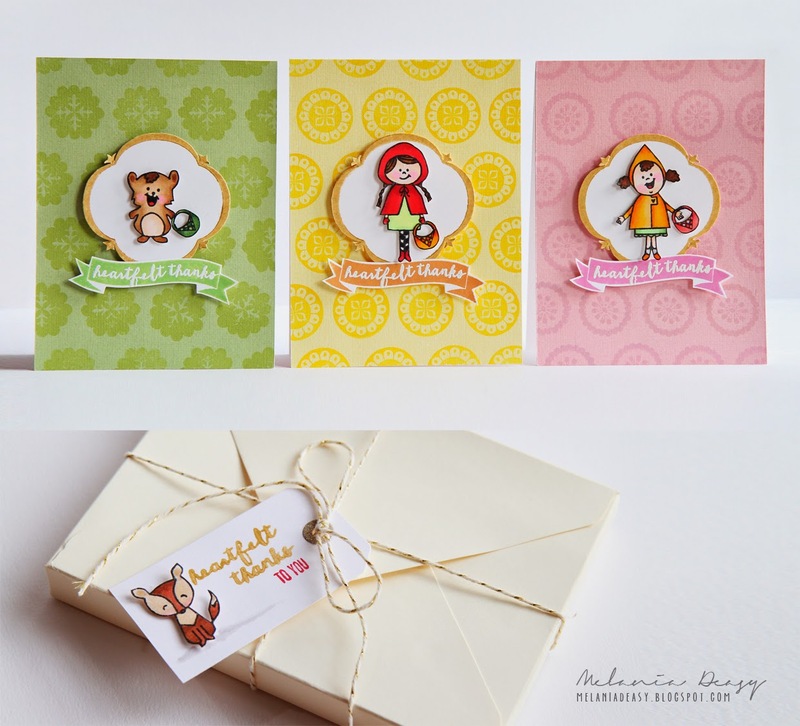 Melania Deasy created this sweet set of cards and gift tag using our Red & Goldie, Build A Banner and Suzani stamp sets. I just adore how cute these little guys look!!! I could gaze at these all day!! 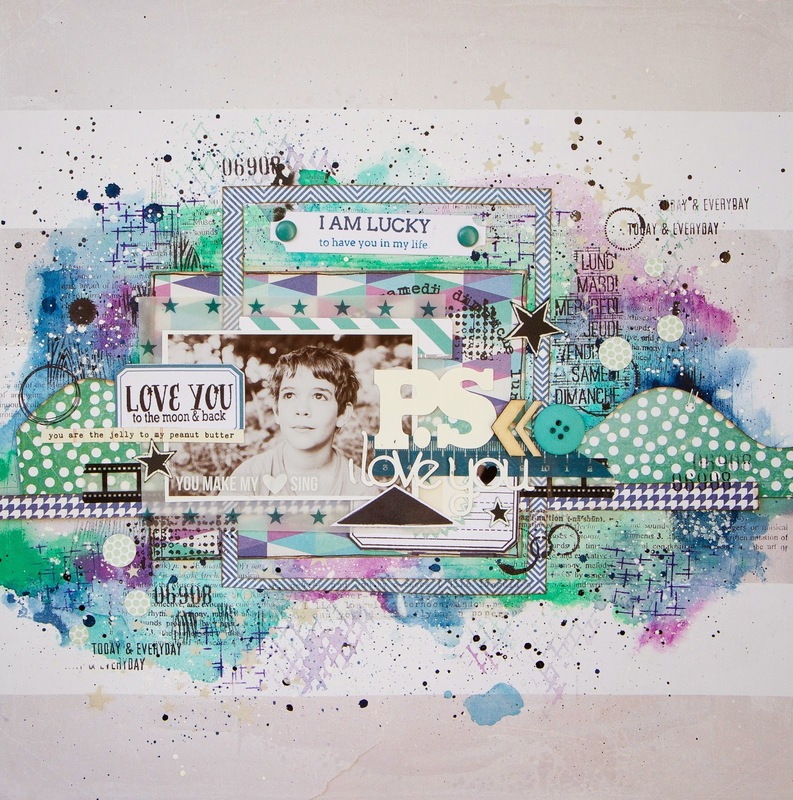 Maska created this layout using our Needle Little Love and Written In The Stars stamp sets. See those cute "hills" along the page and the label at the top center? She made them using our new Custom Panels die set. She shows how versatile this die set is. It is great for cards, scrapbook pages, project life albums and more! I told you that today's projects were amazing!!! These ladies are so talented - actually our entire design team is! We are SO lucky! Thanks for stopping by to take a peek. Have a great day! Today I have some cute cards to share with you that were created by Kasia Curry & Chunyuan Wu. 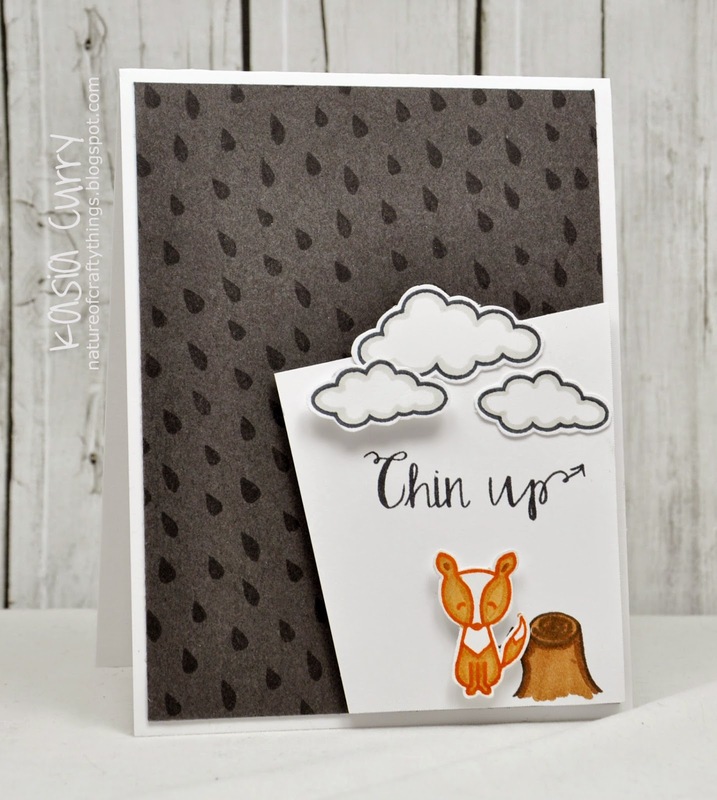 Kasia used our Weather It stamp set to create this first card. I love how she used the fox from Red & Goldie and sentiment from Aim High. I never thought of combining these sets! This is sure to cheer someone up! 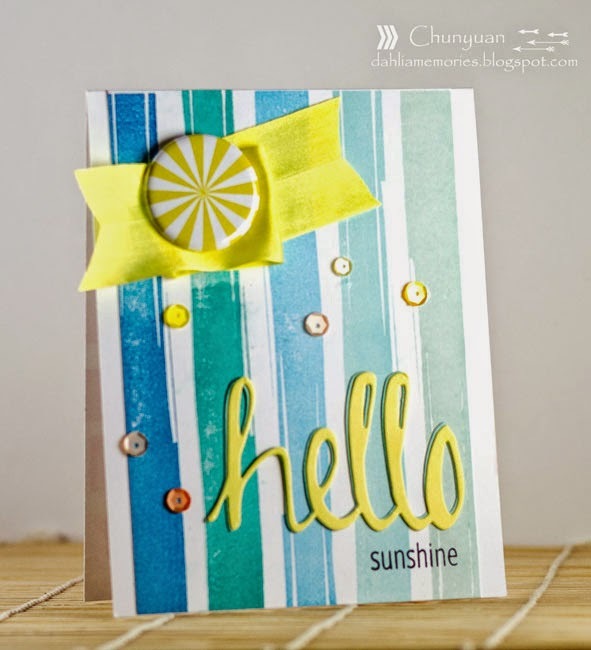 Chunyuan used our Write It stamp set to create this fun card. I love how she paired the sentiment with the "&" from our Count On It set. So clever! 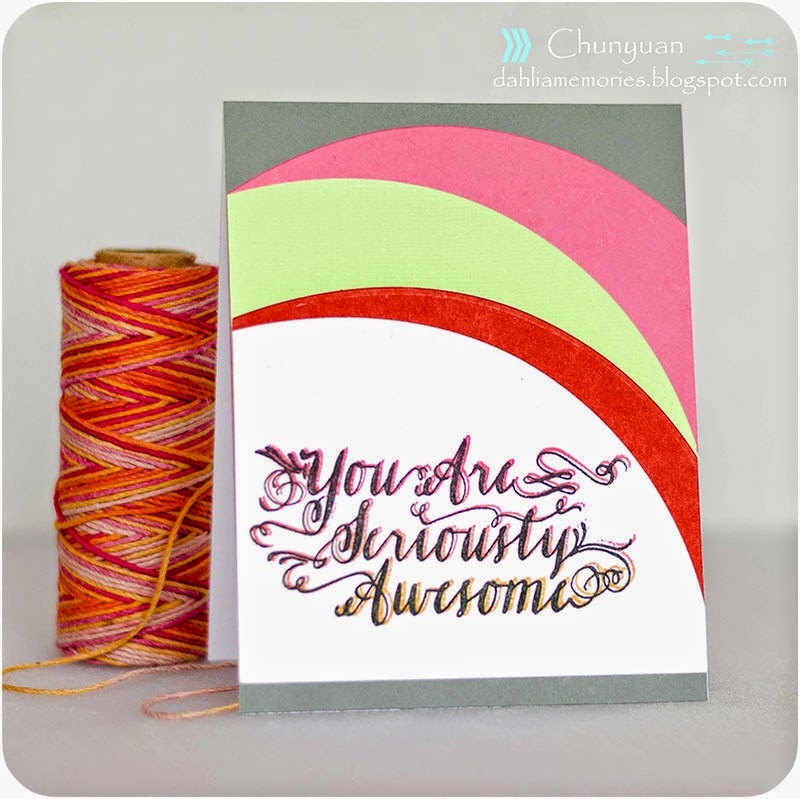 I love how Chunyuan repeated the pen image to create a fun border behind the sentiment in this next card! Please contact bethney @mayarts.com so that we can get your prizes to you. Today I have the pleasure of sharing some terrific projects by Yainea and Caryn Davies. 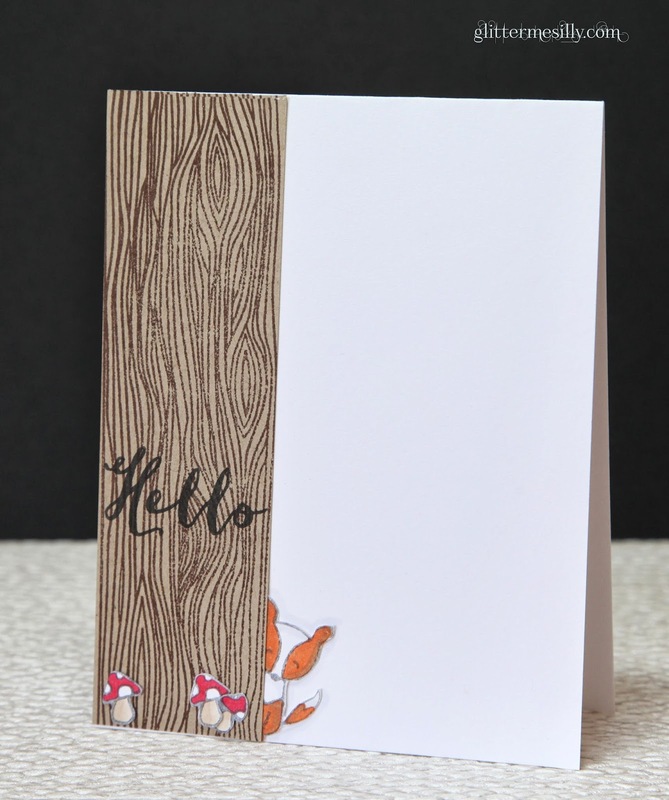 Caryn created this first card using our Red and Goldie & Woodgrain & More stamp sets. I adore that little fox peeking his head out to say hello! So clever! 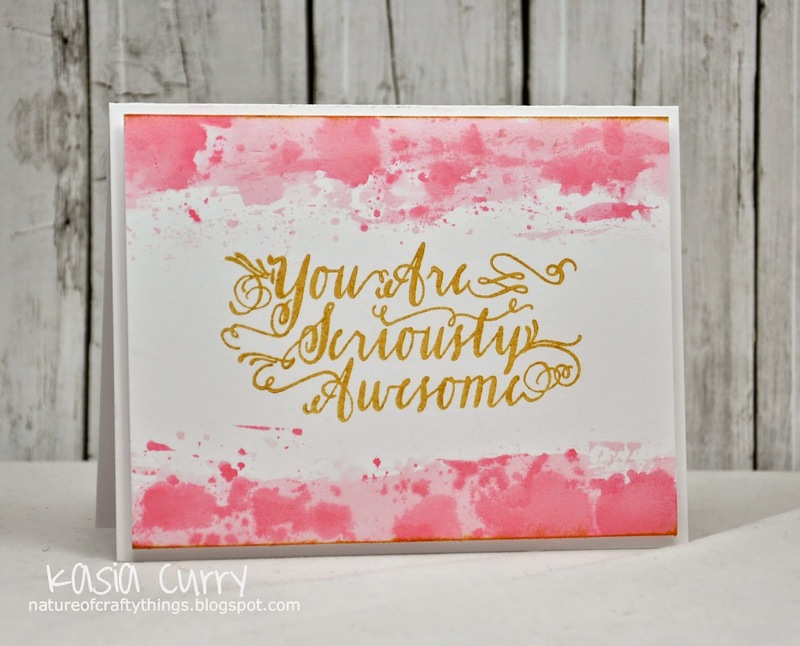 Caryn combined our Red & Goldie and Brushed stamp sets to created this fun card. I love the color combinations and the brush stroke background. 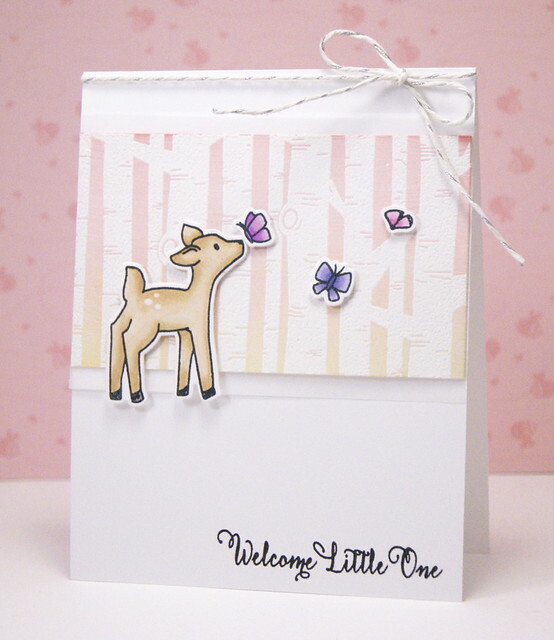 Yainea created this adorable card using the deer and butterfly images from Storybook and the trees from Let It Snow. I love the shading of inks and soft color pallete she used. It is just gorgeous! It's the last day of May Arts, Avery Elle and UmWowStudio week! 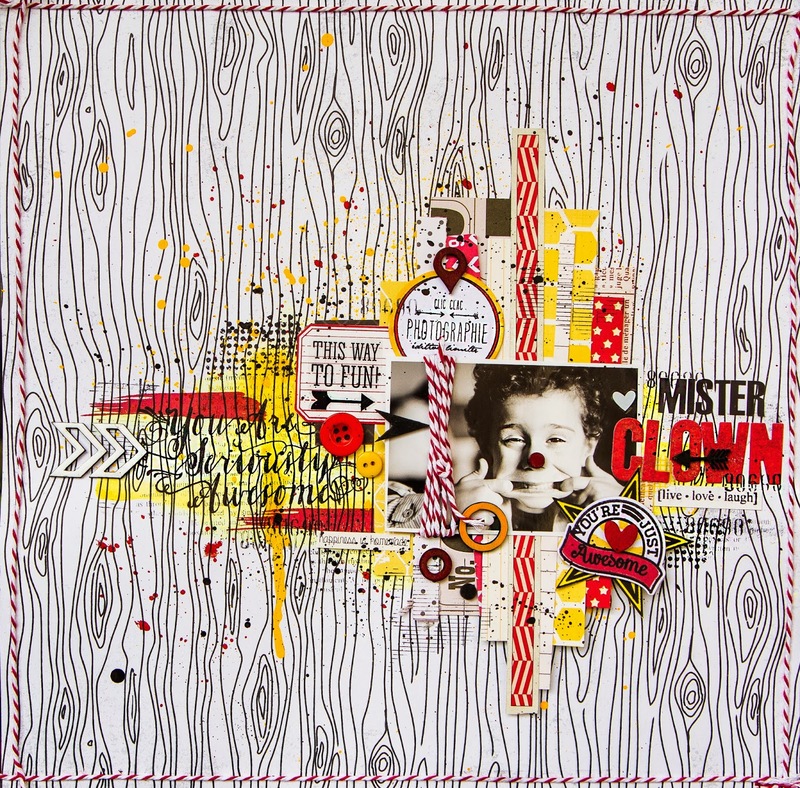 This week the Avery Elle design team is playing with some ribbon from May Arts and fun products from UmWowStudio. After visiting here, be sure to check out the May Arts blog and UmWowStudio blog! 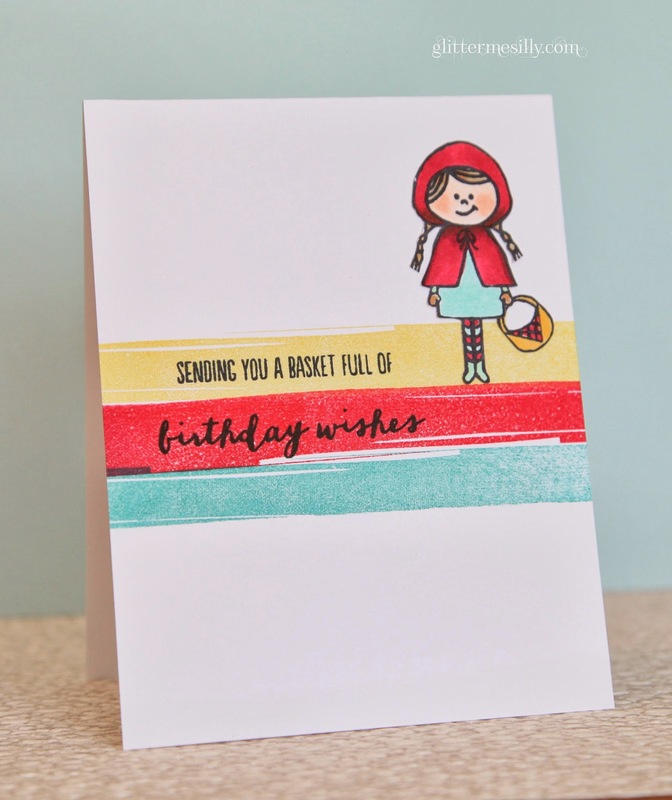 JJ Bolton created this adorable card using twine from May Arts, a stencil from UmWowStudio and our Red & Goldie stamp set and Custom Panels dies. How cute are these hearts floating out of the basket? I love how products from all three companies work so well together! Don't forget that we will randomly pick 3 winners from the blog comments to win the following prize package on this blog, the UmWowStudio blog and the May Arts Blog! You have until Sunday night to comment to enter. 1 spool of May Arts Ribbon – winners choice! 1 Stamp Set from Avery Elle! 1 Mask, 1 set of Flair and a set of layered chip from UmWowStudio! Day 4 of May Arts, Avery Elle and UmWowStudio week! It's Day 4 of May Arts, Avery Elle and UmWowStudio week! This week the Avery Elle design team is playing with some ribbon from May Arts and fun products from UmWowStudio. After visiting here, be sure to check out the May Arts blog and UmWowStudio blog! Heather Campbell created this first card using a fun stencil from UmWowStudio and our Build A Banner and Storybook stamp sets. See that vellum banner? It is our Cheers wine tag die with the top cut off. Cool right? Heather created this next card using May Arts silk ribbon and our Storybook stamp and die set. I love this sweet duck and pretty ribbon! Don't forget that we will randomly pick 3 winners from the blog comments throughout this week to win the following prize package on this blog, the UmWowStudio blog and the May Arts Blog! It's Day 3 of May Arts, Avery Elle and UmWowStudio week! This week the Avery Elle design team is playing with some ribbon from May Arts and fun products from UmWowStudio. After visiting here, be sure to check out the May Arts blog and UmWowStudio blog! Maska created this cute layout using chipboard from UmWowStudio, red & white twine from May Arts and our Write It and Simply Tags Christmas stamp sets. I love the color combination and the circus feel!! We have our guest designer Melania Deasy with us today too. She created this modern and fresh card using our Brushed stamp set which is back in stock. Hooray! I just adore this card. How cool is that background? I could look at it all day long!! It's Day 2 of May Arts, Avery Elle and UmWowStudio week! This week the Avery Elle design team is playing with some ribbon from May Arts and fun products from UmWowStudio. After visiting here, be sure to check out the May Arts blog and UmWowStudio blog! Kasia created this card using burlap ribbon from May Arts, a stencil and chipboard from UmWowStudio and a sentiment from our Written In The Stars stamp set. I love the artsy look. 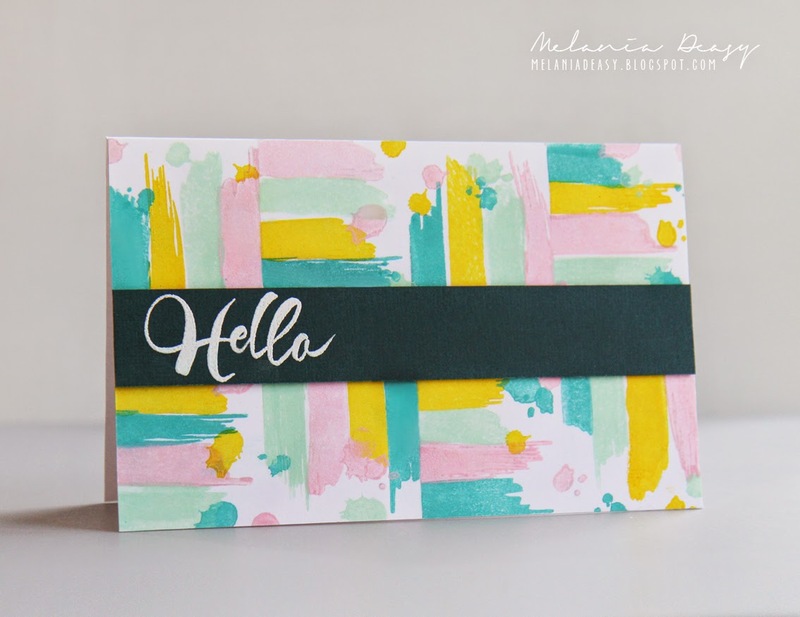 Chunyuan created this fun card using flair from UmWowStudio, silk ribbon from May Arts and our Brushed and Simply Said Hello stamp and die set. The combination of yellow and blue is so cheerful! It's May Arts, Avery Elle and UmWowStudio week!